Similar to the decoration found on our "Divine Office" folio, these two Psalms 123 (122 in the new bible) & 124 (123) are beautifully framed by plants, vines & flowers, each side dotted with an historiated initial & various illuminations. It is likely from the Liturgy of Hours, which is usually performed during the office of Sext week (Tuesday to Saturday). The historiated initial on the recto side contains the painting of a white-robed man, likely a Carthusian or Cistercian monk (of St. Benedict). The historiated initial on the verso side is more difficult to determine; it is clearly a man, in an elaborate robe, the background a dark blue with stars. It is difficult to state exactly who or what the man is, as he could be a bishop, a man of wealth, or a painting of David. The script is believed to be Quadrata, with the thin parchment bearing little damage except for the browning of the edges (due to handling). 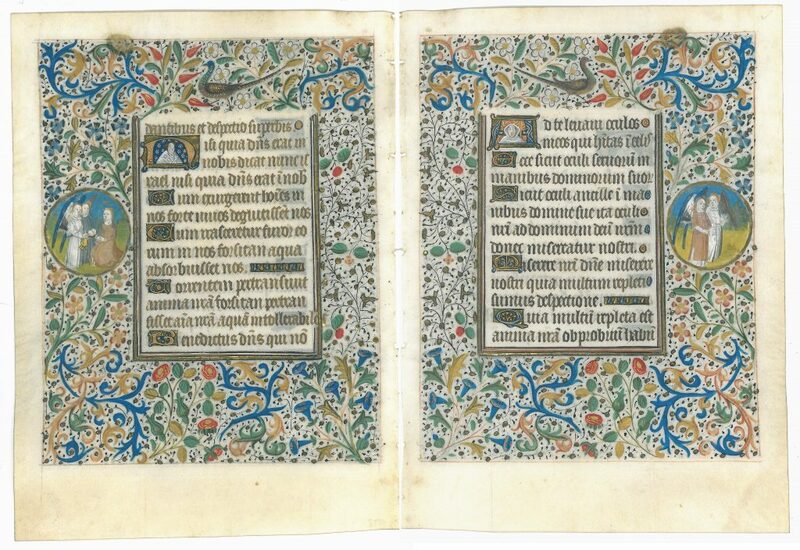 Title: "Books of Hours: Psalms 123-124"
Subject: Liturgy of the Hours, Psalms 123 (122) & 124 (123). Quality: Thin to medium parchment; No damage to the edges, fairly smooth. Slightly browned around the edges; edges of paper lined in gold. No sign of watermarks. Ruling: 13 lines & 1 column on both sides; Borders in gold (text box). Artwork/decorations are not on the full page, but bordered (160 mm x 130 mm). Illuminations: There are four illuminated initials in gold, on both sides, in the middle of the letter or part of the letter itself. There is one historiated initial per side; the 'Recto' historiated initial is the very first letter of the text, while the 'Verso' historiated initial begins on the second line.